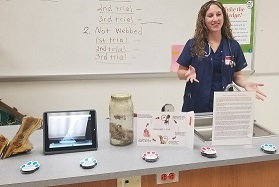 posted: March 26, 2018 by: Megan Harris,DVM Tags: "Clinic Specials" "News"
Dr Megan gave presentations to 4th and 5th graders last Friday at JW Long Elementary Career Day. The students were educated on the steps required to become a veterinarian and what a day in the life of a local veterinarian is like here in Terrell Texas. Rumor has it, the students really enjoyed looking at cool radio-graphs and seeing a real dog heart infested with heartworms.